Arrive in the scenic little town of Bulwer on the afternoon / evening before your Mkomazi River rafting trip. 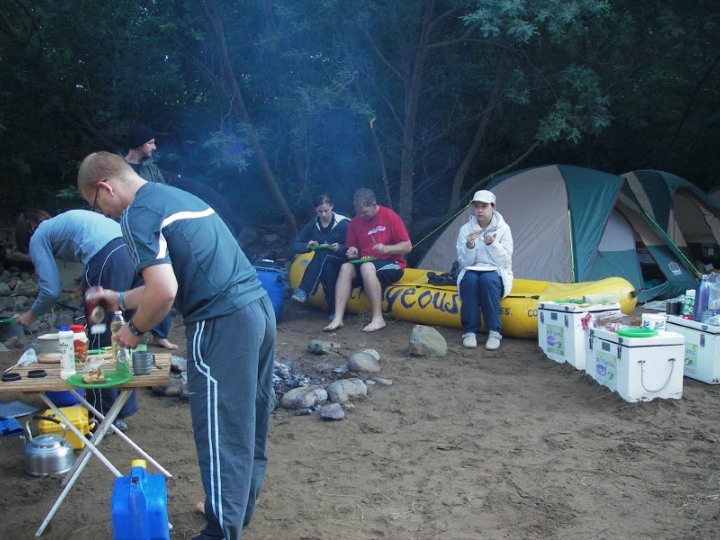 Accommodation and meals the night before and after the rafting trip is for your own account and depends on how much you are prepared to spend. There is a beautiful little hotel in Bulwer, or you can stay at the backpackers at Wild Sky Adventures in Bulwer itself. We usually camp at Hillside Lodge, which is on the road to the Mkomazi River. Also breakfast the next morning, before we head out to the river, will still be for your own account. And don't skip on it! You will need the energy later in the day! 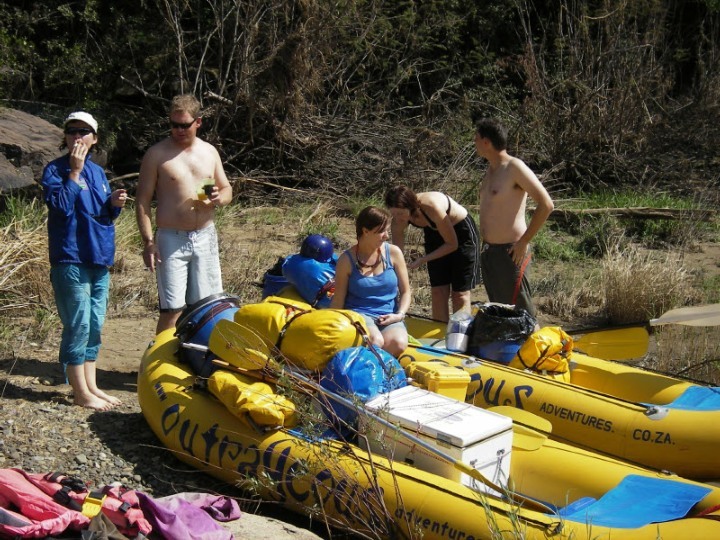 Outrageous Adventures will supply all the meals on the river itself. 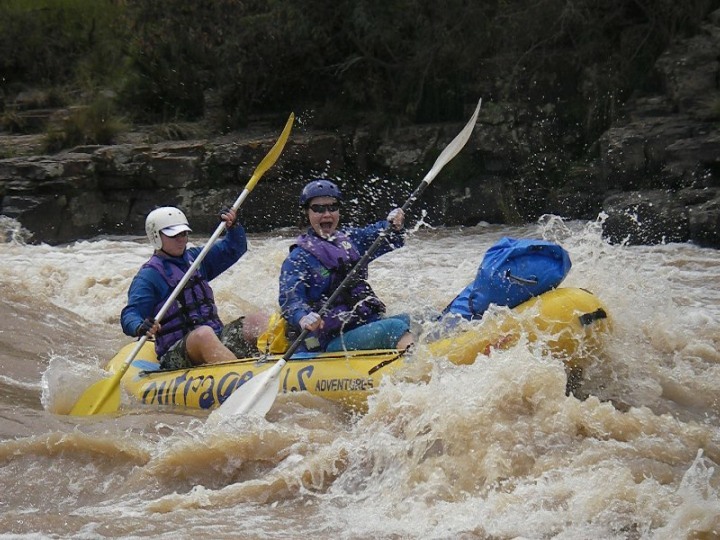 Day 1 - After your hearty breakfast, you will be picked up and transported to the Mkomazi River by the Outrageous Adventures team, where they will do a safety-brief, fit lifejackets and then it's time to hit the water! 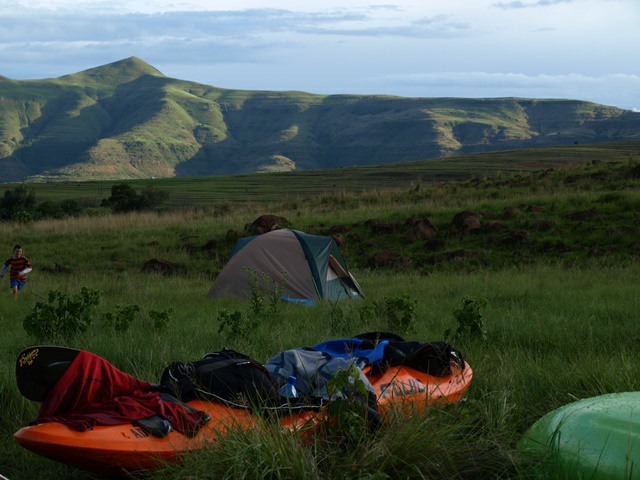 We'll use either 2-man inflatables called 'crocs' or big 6-man rafts, with a guide in each raft, depending on rainfall and water-levels in the river. 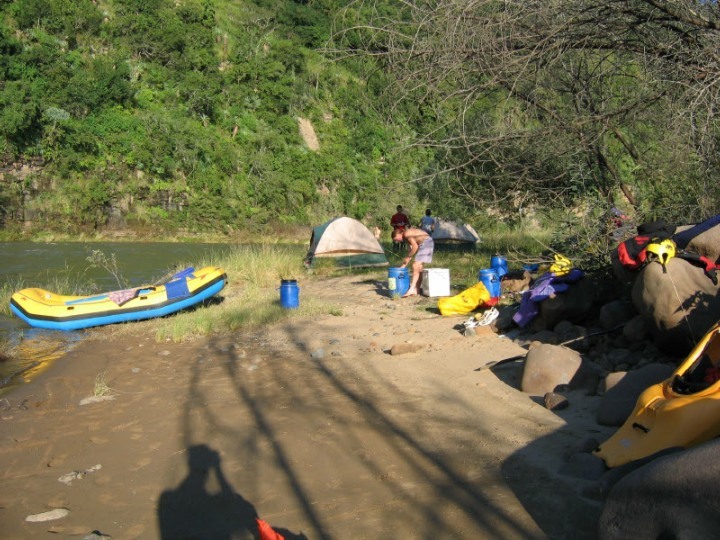 The area is quite remote, the scenery is stunning, and the river lekker exciting (grade 3 and 4 on a rising scale of difficulty from 1 to 6). We paddle everything we need with us, tents, food, etc. and camp next to the river. There is not much space on the rafts, therefore we can only take the bare necessities, no room for luxuries. But it is an awesome experience for those who do not mind roughing it a little! We will have lunch along the way on the banks of the river. Then after lunch it's more paddling and shooting rapids until we find a suitable camping spot next to the river for the night. Then everyone helps with pitching tents, collecting firewood, preparing meals and getting ourselves comfortable for the night. The camp-fires are always HUGE and awesome! And the starry sky amazing! And then, after lunch, it is the same "making camp" routine from the previous day. Now we have some practice behind us and pitching tents, collecting fire-wood, etc. all happens in a jiffy! Day3 on the river. After breakfast it is pack up and straight onto the river again. We will finish our white water raft trip early afternoon, depending on the water-levels in the river. Then it's a quick drive back to Bulwer or the lodge at Hillside. After a warm shower it's time to share all the war-stories of the last couple of days on the river, either in the cosy pub in Bulwer or Himeville, or around the camp-fire again at Hillside Lodge. We are off the river and supper is for your own account again. On these multi-day, self-contained white water river rafting trips, Outrageous Adventures will supply all meals on the river itself. We will also supply all tents and dry-barrels and dry-bags to keep your personal belongings dry. You only need to bring your own toothbrush, sleeping bag, and dry clothes for the night. For your own account will be the accommodation the night before and after the white water raft trip. Accommodation depends on what's available and how much you are prepared to spend. * Life jackets, helmets, splash jackets, rafts and equipment. * Dry container to keep your personal belongings dry. * Highly qualified and professional guides with years and years of experience. * All meals and water while on the river. * Dry and warm clothes for the nights (try and keep everything as limited as possible). * Clothes for on the river, in which you can get wet and dirty, bathing costume, shorts, etc. * Your own wetsuit (optional). * Old shoes or strops, anything that you do not mind getting wet. Mr Price Sport sells some awesome river-shoes for cheap-cheap. * Your own sleeping bag. * Camera (water-proof. If not; rather leave at home). * Straps for your sunglasses or prescription glasses. * Your own energy drinks, bottled water and snacks to be enjoyed as we paddle along. For more information, and our Mkomazi River itinerary, click here!